B reakage: Every TBH keeper will experience the breakage of a comb at some point. It will most often happen if a frame full of stores or brood is turned in the wrong plane, where the weight of the comb pulls it from the frame in a horizontal position. It can happen to the most careful and diligent beekeeper. Freshly drawn, unseasoned comb is susceptible, as is any comb worked on hot, sunny days where heat can weaken the comb attachment. 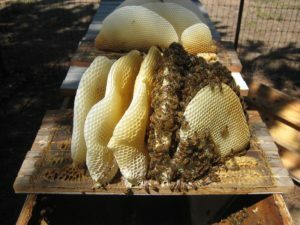 It is apparent that the comb at the right broke because 1) it was cross-combed and 2) the brace comb was not severed before the beekeeper attempted to lift it. This could have been avoided, but must be dealt with now. Cross-combing: Cross-combing occurs when a section of comb is attached across one or more adjacent bars. I have seen extremes where the bees have built their comb 90º to the intended plane of the bars. Cross-combing can make the bar difficult, if not impossible, to lift out of the hive. Bees could care less about our ability to move comb to manage a hive. They are perfectly happy with their arrangement of the hive. It's just a nightmare for us. If comb has been cross-combed, it must be straightened and centered for future management. If the cross-combing is severe enough, the entire comb may need to be cut away and reattached. Cut-outs: Cut-outs are removals of bees from structures where the bees are unwanted. Beekeepers are often called to do removal, which requires that existing comb containing brood and stores be collected along with the bees. 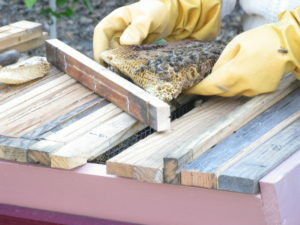 Once the comb has been removed from the structure, it has two options - to be destroyed or to be installed in a new hive. 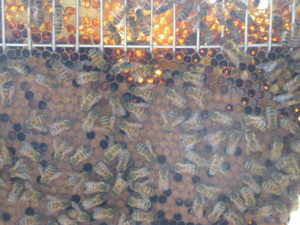 Most beekeepers who do removal choose to salvage the bees to increase their hive count or to sell to other beekeepers. 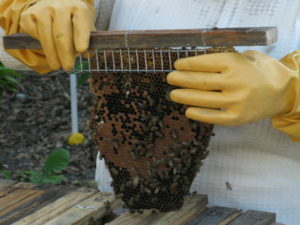 I have seen several You-Tube videos of beekeepers tying the cut-out comb into frames. It just takes too long! Brood can be chilled in cool weather, and the beekeeper can be worn out by the end of the day. Using rescue bars, even on Langstroth frames, takes less than a minute per bar. In fact, a beekeeper on a ladder can dislodge a comb from a building, hand it to his helper who is ready with a rescue frame, the helper can attach the comb to the frame without kneeling down or needing a surface to work on, and can then set the frame directly in their nuc or hive box. 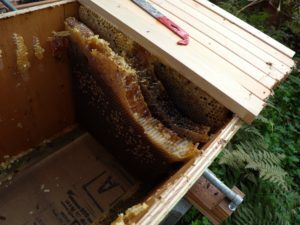 Langstroth beekeepers generally do not have to deal with breakage, but they do have to deal with cut-outs if they do removals; They may occasionally have to deal with cross-combing if they are allowing foundationless comb building. Because the Langs have a wooden frame surrounding the entire comb, they use rubber bands or twine to tie the loose comb into their frames. Sections of comb can be trimmed to fit, and will often fill the entire frame. 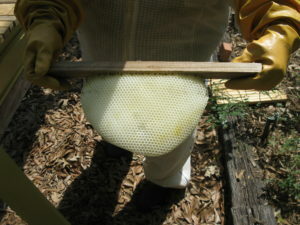 The bees will eventually chew the twine or rubber bands after they repair and attach the comb to the frame. Because TBH comb is frameless, the tie-in method does not work so well. I have tried the twine method and have found it unwieldy, time-consuming at the hive, messy, and largely unsatisfactory. Rubber banding does not work because it much be banded around the comb itself, and can cut into it badly, especially on unseasoned new comb, or comb softened by the ambient heat. We need a method designed to work specifically with top bars. 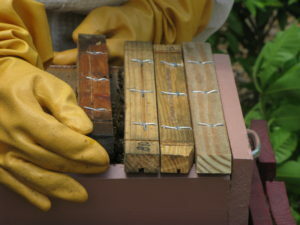 The most common way for TBH beekeepers to tie in or repair comb is the hair clip method. I don't know who first came up with it, but it is widely discussed on bee forums, blogs, and YouTube. MacCartney Taylor with Out Of A Blue Sky Productions has done a good video explaining this method (Hair Clip Comb Repair). Several of his videos show him applying the method in the field during actual hive inspections and he does it well. All of his videos are worth watching BTW. He's a good teacher and presents the material very well. I have used the hair clip method, and it is successful. But it leaves some things to be desired. For one thing, the tie wraps cause the top bars to have a slight gap between them when they are placed back in the hive. If you happen to have several of them back to back, as you would with a cut out or a comb collapse scenario, this gap is doubled and it is bothersome. It changes the comb spacing just enough to make a difference. Another issue is the combs themselves. Although they are widely available at grocery, pharmacies, variety and dollar stores, they are not all created equally. You will need a variety of sizes, to match up to comb size. Some of them are wide enough when closed and installed that they end up being wider than the top bars - wide enough to leave a little gap when they are pushed together. The hair clip has a tendency to crush the top of the comb somewhat. Any honey stored there will leak, which is OK, but brood in those spaces will be killed. It's better to lose a few to save a lot. But killing brood of any kind isn't fun. You have to remember to leave the tie wrap loose enough to open the hair clip all the way and insert the comb. Only then can the tie wrap be tightened fully. The hair clip will need to be removed eventually. They can be reused with a lot of scraping and cleaning. Perhaps they could be cleaned faster in hot water, but I never got that far before I decided there had to be a better way. 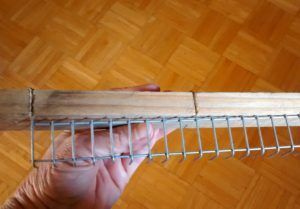 My last complaint about the hair comb method is that the bees seem to take a long time to repair and fully attach the comb at the top of the bar. Other people report a full repair and attachment in just a few weeks. My experience is that it can take 6 months to fully repair the top of the comb. Of course, the combs must remain in place until that is accomplished. The Rescue Bar got its name because it rescued me from the most difficult chore I had in TBH beekeeping, reattaching or repairing comb. This bar is much easier to use than the hair clip method. But its other advantages sealed the deal. The Rescue Bar is much less destructive to the comb than the hair clips. I can use them on the fly, and without brushing all the girls off the comb, so it is less disruptive to the girls. And the bees repair and reattach the comb fully in as little as a week or two. The wire support does not need to be removed later like the hair clips do, which is another advantage. The Rescue Bar was inspired by a similar bar we saw perusing the internet one day a over a year ago. The idea I first saw had merit, but it had a couple of disadvantages. The wire wrapped over the bar, which resulted in a gap between the bars - one of my complaints about the hair clips. It was also hard to bend the heavy wire in crisp 90º turns. My husband and I sat down and put our heads together, and came up with a bar that was 1) quick to build, 2) could be adapted to any top bar style or length, 3) would keep the bars fully closed and flush, and 4) was structurally dependable. The Rescue Bar is comprised of the standard bar (any design will work, including bars with milled wedges) and a piece of 1/2" x 1" welded wire known as rabbit cage wire. This wire is used to build rabbit and bird cages. We got ours at a local exotic bird supply store, but it is available from hardware stores, feed stores, and internet suppliers. We used 12 gauge wire, but 14 or 16 might work. For our size bar, a piece of wire that is 9" wide (18 sections) and 4" tall (4 sections) is cut from the roll. The 1/2" narrow openings are used in the horizontal and the 1" long openings are used in the vertical. Two vertical sections will make the "L" that holds the comb, and two will be used to form the hanger on the top bar. Because we wanted the bars to be flush, we decided to cut a saw kerf in which to bury the wire in the edge of the bar. There were other options, but this was the fastest and simplest. We like the K.I.S.S. principle. To do this, we trimmed all of the "webbing" between the first, middle, and last long wires. We used rabbit cage staples for strength. We decided to staple the wire to the top of the bar rather than the bottom so it would be as strong as possible. It could have been stapled to the bottom of the top bar, but it is not as strong a connection. In addition, it is easier to press the comb on against the smooth wood rather than the wire grid. We have very little comb destruction this way. We can also easily ID the Rescue Bars when we remove the hive covers. They could be labeled as well. To form the "L" that will hold the comb, we bent the last set of long wires 90º to the vertical section. This leaves a row of "teeth" that hold the comb firmly. Even comb full of honey is supported. The saw kerf combined with the length of the "teeth" allows you to center the comb on the bar. The vertical portion of the "L" is stiff enough that you can also press any curve out of the comb. This is helpful if the reason you are reattaching comb is due to one or both ends of the comb having been cross-combed to another bar or being too curved for comfort, as the bees like to build naturally. This size works for 32mm (1 1/4"), 35mm (1 3/8"), and 38mm (1 1/2") bars, although you will have less need to reattach comb to 38mm bars since it is usually honey comb. We have attached full combs of capped honey just to test the strength of the connection. The loose comb should be pressed slowly and gently onto the teeth of the Rescue Bar. It is easy to eyeball the distance and get the top of the comb as close to the bottom of the top bar as possible. You do not have to brush the bees from the comb, just press the comb slowly enough that you will bump the bees and give them time to move out of the way of the wire. 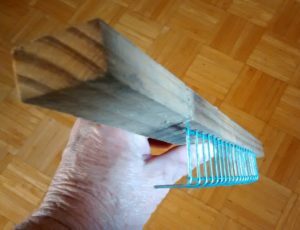 The teeth of the Rescue Bar may come all the way through the comb, or be embedded in the comb, depending on comb thickness, but it is pretty easy to center the comb on the bar. If the comb is very soft, it may be easier to lay the bar on a surface to press the comb onto the bar. You can support the back of the comb so you don't crush any bees. 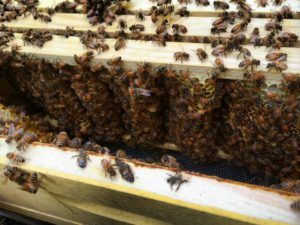 As soon as you have the top of the comb mostly attached, you can lift the bar to check the back side and make sure you don't trap any bees in the wire and that the comb is centered on the bar. The Rescue Bar supports a full frame perfectly. 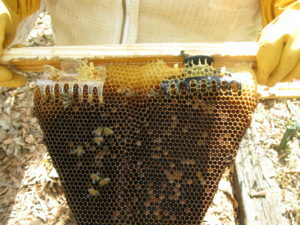 Once the comb is reattached, the Rescue Bar can be placed back into the hive. It is a very quick process, which keeps it from being disruptive to the hive. Because the wire is embedded in the saw kerf, the bars sit flush and completely closed even if several bars are used in sequence, as they would be when attaching comb from a cut out. Several pieces of comb can be attached across the bar if necessary. The bees will eventually turn it into one solid comb. The comb shown at the left had been reattached to the top bar with hair clips about six months before this picture was taken. The bees had yet to completely repair and attach the comb at the top of the bar. The method works, but the bees have to work around the comb and part of the comb becomes inaccessible. The clips have to be cut out later, whereas the wire can be left indefinitely. Some brands of hair clips are wider than the top bars, necessitating the use of spacers. This comb was attached to this top bar about two weeks before this picture was taken. The bees completely repaired the comb and fully attached it to the bar. You can just see the wire at the right of the comb. Only one row of cells is inaccessible and virtually no comb is destroyed with the attachment. 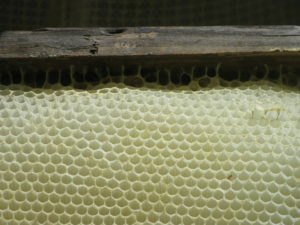 This is a close up of a Rescue Bar two weeks after the comb was attached. You can see the great job the bees have done of repair and reattachment. Even the cells within the top part of the "L" can be worked. This is not the case with the hair clip method. This is a brood frame. With hair clips, all cells within the clips are rendered useless to the bees. With the Rescue Frame, only one row of cells is affected. Less brood loss, less honey loss. I pressed this one on a little low, leaving a bigger gap than I would have liked, but it didn't seem to bother the bees a bit, and they had it filled in in no time. This was a new comb, and very light. It is better to capture as much of the comb as possible between the row of wire teeth and the bottom of the bar for a secure hold. This is a seriously cross-combed Langstroth hive. Lang frames can be made into rescue bars, too. 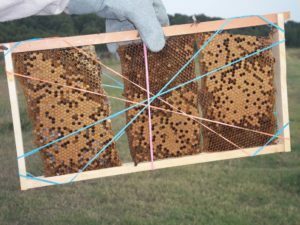 It may be a more secure connection than the rubber band method, and fewer bees will be disturbed by the process. Bees do not have to be brushed from the comb. The combs can be cut from these bars and reattached very quickly. This will prevent brood from being chilled, and will get the bees back to work quickly.